The Capillata is the name of the ship Creatures Docking Station is set in. She was genetically engineered by The Lone Shee to search for and dock with The Ark. As the Docking Station Story goes, the Lone Shee emerged from his hidden lab not long after discovering the Warp, only to find that the rest of his species had apparently abandoned him. He was able to conclude that they had flown off in search of greener hemispheres (or, in fact, any kind of spheres at all), and so he set about growing a ship from whatever genetic materials his fellow scientists had left behind. Though he initially used test tubes to grow the Capillata, she soon outgrew them, and he was forced to transport her to the Eastern Ocean to complete her growth. 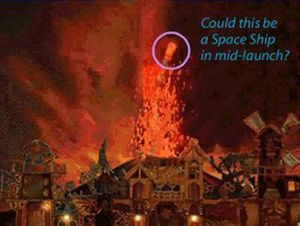 The Lone Shee used the volcano to give the ship the initial thrust she needed to launch into space. The resulting eruption caused Albia to change drastically, transforming it from the simple Creatures setting into the larger, wilder Albia that is found in Creatures 2. This launch occured between Creatures and Creatures 2, and after The Ark was launched, placing Creatures 3 after Creatures and before Creatures 2. The Lone Shee created and developed a form of technology called The Warp which only finished after The Ark had been launched, meaning The Capillata is the only ship (as of Feburary 15, 2005) to sport Warp Technology, and that is the main reason almost all of the official Creature Labs Docking Station Story entries are based around her. The Capillata contains four metarooms: The Hub, The Norn Meso, The Comms Room and The Workshop. The Workshop contains the Portal Dispensor and The Containment Chamber. The Norn Meso contains Muco the egglayer and various environments for Norns to live in. The Comms Room contains The agent creator and various online utilities. The Hub joins these three metarooms and The Ark (if you have docked Docking Station with Creatures 3). The Capillata may not be female. The Lone Shee is simply following tradition. This page was last modified on 29 October 2016, at 01:13.